NOTE: Sadly, this film is not available to view online at current. If and when it is I’ll update this post. The 100th Job does something that is very hard to do for a short film – it tells not only a complete tale but a completely satisfying tale. While other shorts might be a thumbnail sketch this is a fully realized picture. It consistently and effectively uses voice over narration and the narration serves many purposes: it informs, pushes the tale along and greatly entertains. The narration is also well delivered by the film’s writer, director and star Micki Mihich. There are cutaways which are used very creatively in this film, for example, cutting to a definition on a dictionary page or to our narrator talking in another location, this technique was somewhat reminiscent of Tarantino. There is also a quick and effectively shot flashback, which is somewhat reminiscent of Argento. Even though the aforementioned techniques were reminiscent of renowned directors both in this film had their own flair and the combination of them in the same story makes them unique and an homage. The 100th Job is the tale of a hit man with an interesting past and an even more interesting present. The past made all the more interesting by the fact that this hitman used to be a very special brand of serial killer who is sure to make any film buff chuckle. The title refers to the kill that will make our protagonist a made man. 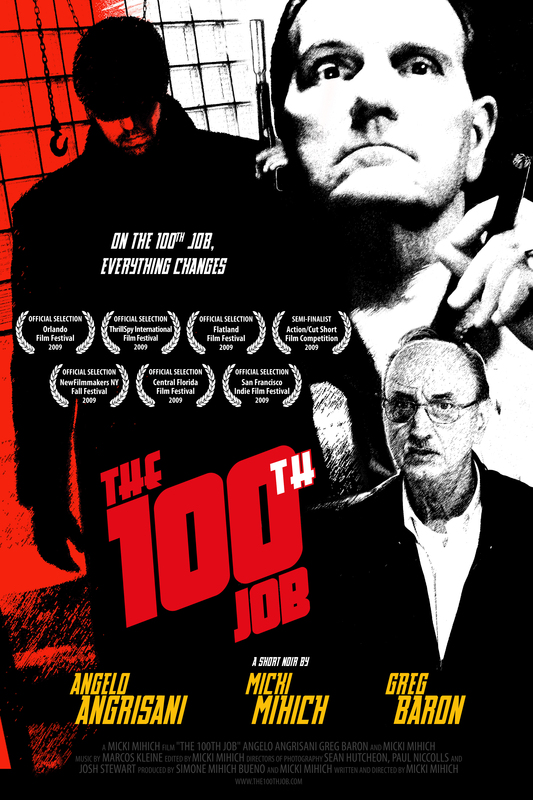 As the tagline suggests “On the 100th Job, everything changes” and the film delivers a fantastic twist at the end which is perfectly timed. What is also very unique for a short is that it has a very memorable and catchy score composed by Marcos Kleine. This is a great short film that is worth seeking out.